As the melting point of tungsten is as high as 3653 K, powders are sintered by electric heating or furnace heating in a reductive atmosphere or in a vacuum, both of which require a lot of energy. On the other hand, tungsten cannot be so easily machined, so it is a problem to find appropriate machining conditions and to reduce material loss at machining. The key technology to reduce energy for the sintering process is miniaturization of the crystal grains. Toshiba Materials Co., Ltd. researches and develops to improve the sintering property and machining property of tungsten materials. Specifically, we are investigating the effect of miniaturization of the crystal grains of tungsten powders and tungsten-rhenium powders on the sintering property and the high-temperature deformation property after ultra-heavy machining by mechanical milling (MM). At present, the following results have been obtained. The sintering property of tungsten powder and tungsten-rhenium powder is improved by MM, which miniaturizes crystal grains. The more rhenium is contained, the higher the temperature at which the miniaturized crystal structure is maintained. MM-processed sintered materials have higher deformation properties at high-temperature compression. The sintered material samples, which have miniature crystal grains and whose crystal grain growth was suppressed at elevated temperatures, have high deformation properties. 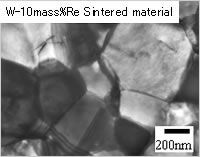 In particular, W-10mass%Re sintered material seems to have the potential to be super-plastic deformed even at temperatures as low as 40% of the melting point (04 Tm). We look forward to continuing our research on purities or sintering processes to apply their results to the products.